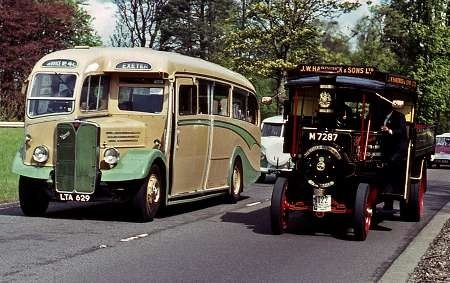 Pictured on the A23 during an HCVC London – Brighton run in the 1970s is LTA 629, an AEC Regal III 9621A (sliding mesh gearbox) with a Duple C32F body that was delivered to the Devon General Grey Cars fleet in 1950. Though the livery it has here is not the maroon and grey it wore as fleet no. TCR 629 of Grey Cars. The rear underside of the bodywork is raised to avoid it fouling the ramps of ferries. This coach has since been repainted into its original guise:- It can be seen here. In the above picture it is seen overtaking M 7287, the 1915 Foden steam wagon no.5218 that rejoices in the name “Gwennie Willan”. This coach was withdrawn by Grey Cars (Devon General’s coaching fleet) in 1958, along with its sister vehicles in the batch LTA 623-634. The whole batch was sold to Greenslades Tours of Exeter, a previously independent company that had become a BET associated company in 1953. The livery it is carrying in this photograph is that of Greenslades. The modified rear end was to clear ferry ramps at both Torpoint and Dartmouth. The Greenslades livery shown here is quite authentic, as many Grey Cars coaches were transferred to that company, like Devon General a BET concern, towards the ends of their lives. The batch of 12 coaches of which this is one were all withdrawn after only eight years with Grey Cars and all went to Greenslades. LTA 629 appeared on the Brighton Rally in 1968 whilst owned by Colin Shears, then was there again in 1973 having just recently been bought by Dave Sayer of the Mersey & Calder Bus Preservation Group, accompanied by two other vehicles from the group – I know because I was there with them ! The combination of 9.6 engine and crash gearbox produced possibly the best ever variation of the AEC Sound in my opinion, and though it later looked mighty fine restored to the Grey Cars livery I always thought that it looked superb in Greenslades livery too. The AEC crash gearbox took a bit of getting used to initially if you had only experienced the slower Leyland PD1. Bristol or Guy as it was a surprisingly quick change, but once mastered it was a joy to drive. In the 70s did it have the lower ratio diff ie lower top speed? I think when it as in the ownership of Colin Cowdrey in recent years I seem to recall him saying 37/38 was top speed which is less than my 2 Regals where 42/43 is a comfortable cruising speed. I certainly seem to recall that this Regal was capable of more then 37/38 mph on the few occasions I drove it. I will ask Dave Sayer next time I see him. LTA 629 along with Leyland GDM 494 have now both passed to Nick Szkiler t/a The Classic & Sports Car Centre, West Knapton, formally Grundy Mack.